Summary : This tea from the Dragonwater Tea Company (now out of business) has a very light and pleasant taste. For those who don't like the stronger oolong teas, you'll be pleasantly surprised by how subdued the flavor of this tea is. A very good "starter" oolong tea. Review : It's now 1am Pacific Time. And here I am, writing up a tea review. If you haven't figured it out by now, I have no life beyond my computer and web sites. But at least I'm honest about it. Yet, there are certain advantages to this...namely I love to experiment with new things, especially teas. My experimentation in tea tasting makes up for the "no life" part. As I've become something of a fan of oolong teas recently, during my last order with the Dragonwater Tea Company (now out of business) I picked up quite a few of their sampler oolong teas. This particular tea is called Ti Kuan Yin (Iron Goddess). While one would get the impression from the "goddess" part of the name that this tea is strong, overpowering and overall just plain "dominant," I found nothing of the sort in this happy tea tasting experience. Here is the description of this tea as provided by the Dragonwater Tea Company (now out of business) : "Ti Kuan Yin (Iron Goddess) Tea. 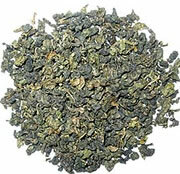 Ti Kuan Yin is the most famous of the Chinese Oolongs. This tea produces a light, sweet cup with a fragrant orchid finish." This tea has a very pleasant aroma straight out of the vacumned sealed pouch it is packed in. It isn't a strong fragrance, but what there is quite pleasant...if a bit on the light side. And this "light side" also shows up in the teas color once brewed, sort of a very, very light orange color. The taste of the tea more or less matches its color too. It is quite pleasant, but light. The flavor won't overwhelm you, or knock you dead in it's tracks. Indeed, the tea even has a "light flowery" taste to it, which I rather liked at 1am in December in Northwest Nevada. This tea has no bitterness. And it also lacks the "punch" that some other oolong teas have that can lead to puckered lips as you swallow. In short, this is just a "smooth" tea, both in taste and the way it goes down. All in all, this is a very good "starter oolong" tea for people who have never experienced oolong teas (or at least a good one) before. Recommendation : Yes. A very light colored and light tasting oolong tea, with a very subdued "flowery" taste to it. Makes for a good introduction oolong tea. Little after-taste and no bitterness round out this teas characteristics. Brewing Instructions : Use 1 tablespoon of leaves. Pour 6-7 ounces of water heated to 180 degrees over leaves. Let brew for 2 minutes.